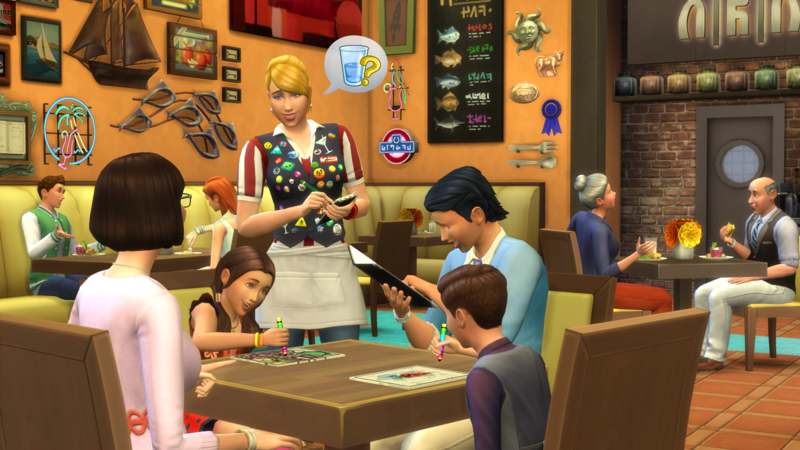 Your Sims can do more than just visit restaurants in The Sims 4 Dine Out Game Pack*. If they’re feeling a little more ambitious, potential restaurateurs and foodies can customize their own restaurant. There are so many ways to tweak, add spice, re-arrange, and build your restaurant that… well, let’s stop talking and start explaining! We put together a list of ways you can customize a restaurant, and even a video showing what it’s like to run your own. 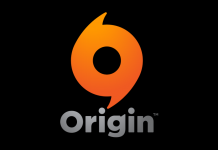 With these tips in-hand, you’ll be able to improve overall star rating, leading to higher profit and success! Give it a Name. What’s in a name? You tell us. No, seriously. Every restaurant needs a name and we’ve given you a quick and easy way to provide one for your latest food service establishment. Pick the Aesthetic. If you’ve ever been to a restaurant review site, you know the setting and ambiance is a priority for restaurant goers. Get creative with your restaurant by making it a subterranean dungeon dining experience, or an outdoor garden, complete with a hedge maze. Put dining a few stories up to provide a view, or simply recreate your favorite hometown diner. Stir in the Basics. The requirements for a Restaurant Venue are quite simple, which provides you with a lot of flexibility in making a unique one. You’ll need a place to use the restroom and clean up, the Host Station, Waiter Station, and Chef Station, and several Dining Spots. The Dining Spot isn’t just a table, but a combination of tables and chairs. Or, stools and tables. After all, people need to sit when eating. Sims aren’t goats! Mix in Some Spicy Décor. If you have outdoor seating, but sure to place the all new Heat Lamp to keep your diners toasty. Add in the new booth object when you want variety from the typical dining chairs and stools. Give your kitchen that authentic feel with the food racks, and be sure to prominently display the Nectar Fridge so you look appropriate high end. Players who are themselves avid diners can place their Experimental food photographs on the walls. And, finally, the gorgeous, huge new aquariums will both look amazing and keep the day’s catch fresh for your new seafood restaurant. 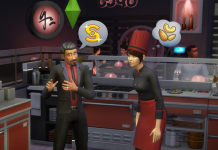 The decorative options in The Sims 4 Dine Out are truly the chef’s choice. Design the Signage. One of our favorite new object suites in The Sims 4 Dine Out is our customizable sign set. Choose from a few blank signs which can be placed flat against the building, stick out, or place on the ground. Then, choose from a variety of symbols, letters, and colors, to create a sign that is unique to your restaurant. This is such a fun, simple creative tool to use with a variety of restaurants! Define the Attire. Sims can wear practically anything, and we recognize it’s important for your stories that they look appropriate. Using a simple menu, you can define how customers dress when they arrive to dine at your restaurant. Is it a formal venue? Boom, choose formal. Do you want people to dress a little sillier? Maybe party is the way to go. Define the look from start to finish! Clothe the Staff. Every restaurant has Chefs, Waiters, and Hosts, and they all need clothing! How much, and what, is completely up to you. You can quickly choose from a series of preset clothing, or you can enter Create a Sim for every role, and every gender for that role. 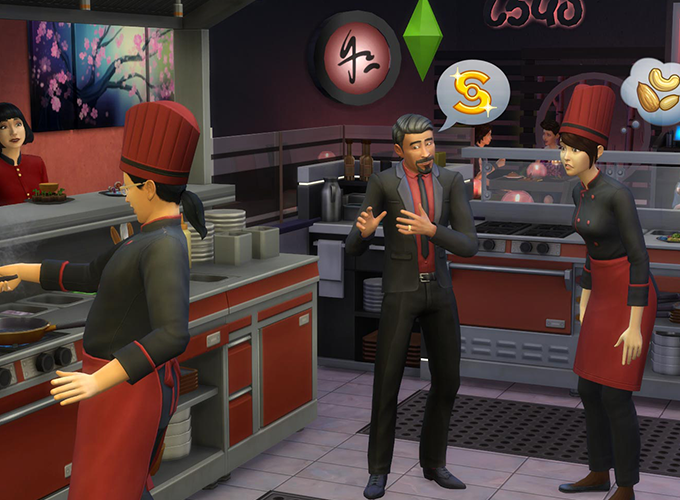 Do you want your waiters wearing Bear Suits from The Sims 4 Outdoor Retreat Game Pack*, or perhaps the Knight costume from The Sims 4 Get Together*? Go for it. Perhaps you want to go classy with board shorts and bikinis for your host employees? Also possible. The clothing is so crucial for creating a thematic, hilarious, or real-world mimic and the choice is up to you. Customize a Menu. 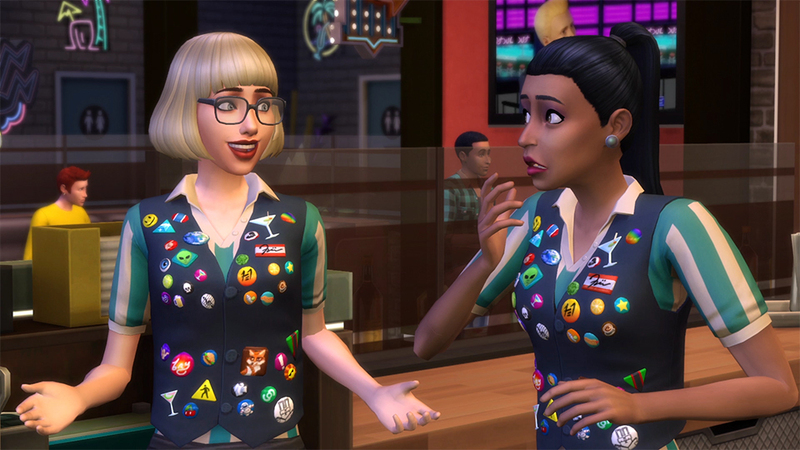 Like so many things in The Sims 4, you have the choice to customize something to make it YOUR story! You can load preset menus to tweak them slightly, or you can pick and choose each and every dish the restaurant serves. This includes the Appetizer, Main course, Dessert, and Drink options! The images are beautiful and vibrant and everything looks tasty. The hardest choice will be figuring out what NOT to serve at the restaurant! Learn from My Library. 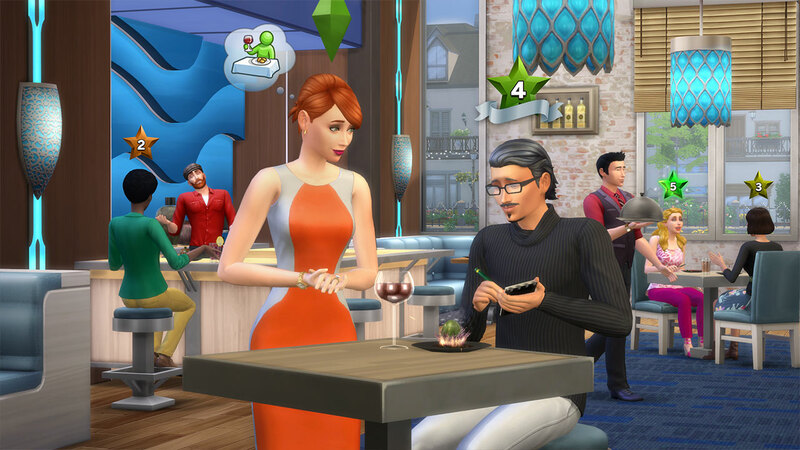 If you aren’t sure where to begin with your restaurant, you can head over to My Library for six gorgeous pre-made restaurants that are included with The Sims 4 Dine Out. 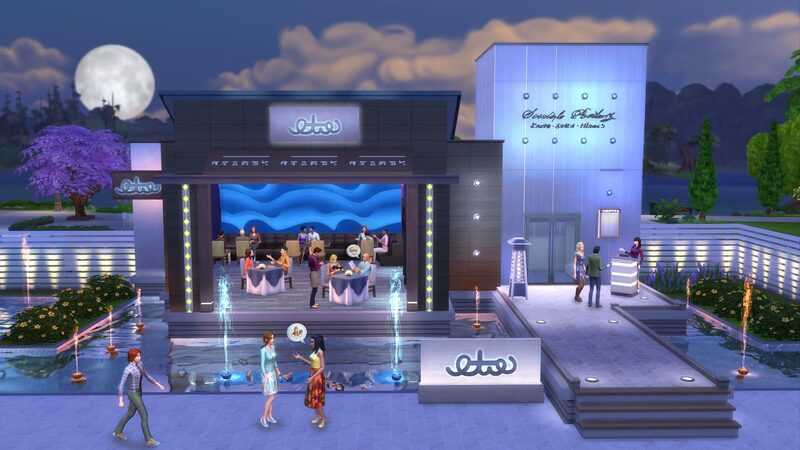 Chez Llama will show you just how beautiful a restaurant can be, while Hogan’s Burger Bar pays homage to The Sims 3 and is the neighborhood’s burger hangout. Naturally, The Diving Pelican is a seaborne seafood restaurant that will show you how the tail wags the fish. 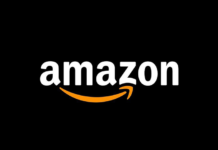 If you need inspiration, we’ll get you started! Share to the Gallery. One of our favorite features of The Sims 4 is the Gallery, as it is the perfect way for our best creators to easily share their ideas. 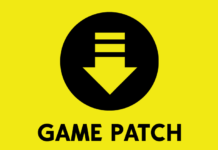 Plus, fans who are less inclined towards building can pick and choose from the best of the community. Be sure to share your restaurants to the Gallery as soon as you put the finishing touches on the menu! Also, it’s good to know that your staff outfits, customer dress code, and customized menu are all preserved with the physical restaurant as well!